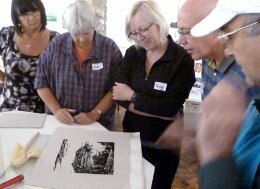 Lee offers workshops in fine art printmaking for small groups and individuals, giving you hands on experience with proper equipment and skilled instruction from a professional printmaker. The 2019 programme is in preparation, but please do get in touch if you are interested. These workshops also go well with painting holidays and other creative pursuits. 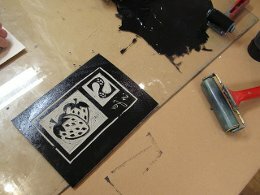 This is an introduction to relief printmaking at Lee's studio in Rosudgeon. 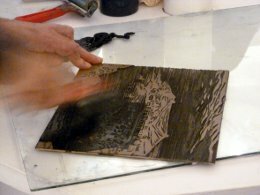 The workshop is ideal for anyone interested in using wood or lino to create an original artist's print without using a press. Places are limited to 2 people per workshop and are held on a day arranged by mutual agreement. The cost includes basic materials. Workshops run from 10am to 4pm. Lee is holding a workshop for anyone interested in creating lino printed Christmas cards from their own design. It is on Saturday 10th November at The Redwing Gallery, Penzance from 1.00pm until 4.00pm. It costs £20 and includes a lino block, tools, paper and inks . You won't need a press but you will need an apron! Book a place via the gallery , redwingprimitive@gmail.com or via the contact page.